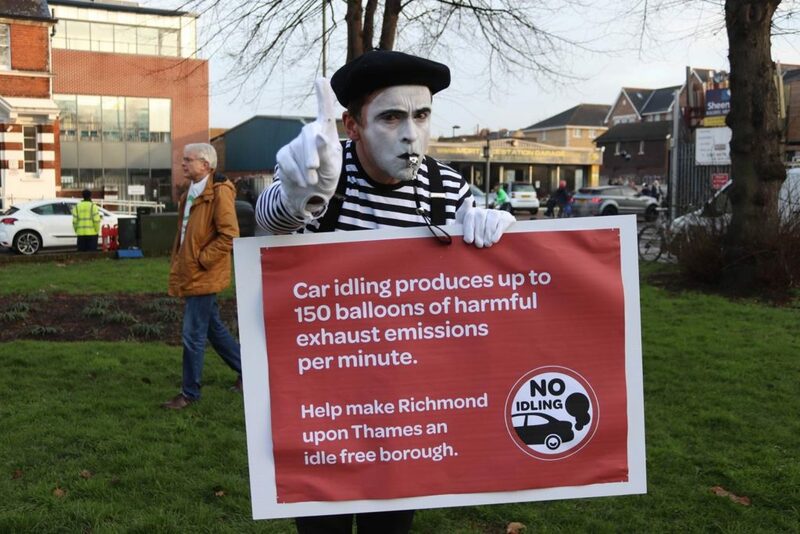 A mime-artist asked drivers at a level crossing in Richmond upon Thames to turn their vehicle’s engines off yesterday (January 24), ahead of March 1 when drivers in the borough could be fined £40 for idling. The mime artist joined councillors, children from Thomson House and Deer Park Schools, volunteers and guests in Richmond to launch the Council’s ‘idle-free borough’ campaign. Car idling produces up to 150 balloons of harmful exhaust emissions per minute, wastes half a gallon of fuel an hour and is a major contributor to the 40,000 deaths a year linked to air pollution outlined by the Royal College of Physicians. Hundreds of black balloons were also released at Richmond Station as volunteers spoke to commuters and pedestrians about the importance of anti-idling efforts. Cllr Alexander Ehmann, cabinet member for transport, streetscene and air quality said: ‘It’s our ambition to make this borough a leader in the crucial fight to improve air quality in London. That’s why we have been out asking drivers to join our efforts to make Richmond upon Thames an ‘Idle free borough’ in 2019 and beyond. ‘One of the biggest contributors to poor air quality is the harmful emissions produced by drivers leaving their engines running whilst stopped for lengthy periods. From March, Richmond Council will be giving parking enforcement officers the powers to fine those who refuse to turn off their engines when asked. A tweet from Richmond councillor Seamus Joyce which showed a parking enforcement officer out and about in the borough recording registrations of cars that were idling provoked a big reaction on the AirQualityNews Twitter page.